Salman Khan is all set to present his upcoming film Tubelight later this month. Meanwhile, the 51-year-old actor keeps his fans posted with some behind-the-scenes pictures from the film's set. 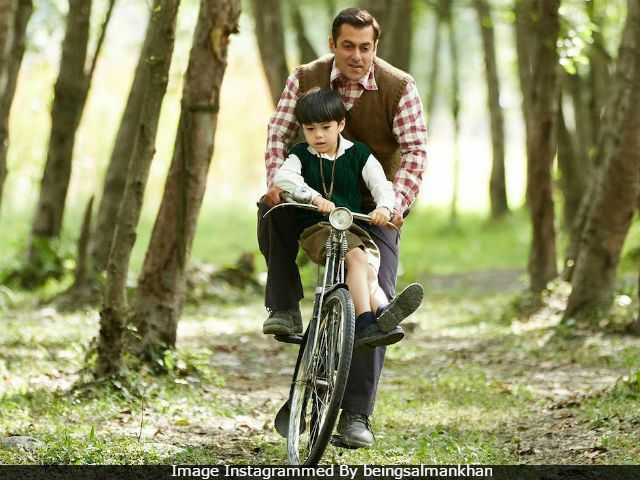 The latest addition to the album is an adorable picture of Salman with his co-star Matin Rey Tangu. In the picture, Salman and Matin are seen enjoying a cycle ride. Salman posted the picture on Instagram and captioned it as, "Main aur mera Matin." Tubelight is directed by Kabir Khan and also stars Chinese actress Zhu Zhu, late actor Om Puri and Salman's younger brother Sohail Khan. Shah Rukh Khan also has a cameo in the film. Here's Salman's picture with Matin. We also bring to you some of the behind-the-scenes pictures from the sets of Tubelight, shared by Salman previously. Tubelight is set against the backdrop of Sino-Indian war in 1962. Salman stars as Laxman while Sohail plays Bharat, an army office. Laxman and Bharat are brothers in the film. Salman and Sohail are co-stars of films such as Maine Pyaar Kyun Kiya? and God Tussi Great Ho. Of the film, Salman earlier told news agency IANS, "The character in the film took me back to my school days. Sohail and I used to recollect so many memories of our childhood." Three songs from the film - The Radio Song, Naach Meri Jaan and Tinka, have been unveiled as of yet. Tubelight is Salman Khan's third film with Kabir Khan. They previously collaborated for Ek Tha Tiger (2012) and Bajrangi Bhaijaan (2015). Tubelight releases on June 23, two days before Eid.